"Les 4 Baigneurs" offers seasonal cuisine aimed at showcasing regional products from local producers. Bourg-sur-Gironde, former fortified city, is today a medieval village full of charm of yesteryear. Formerly at the confluence of the Dordogne and the Garonne, Bourg is first and foremost known for its vineyards and wine called "Ribs of Bourg". 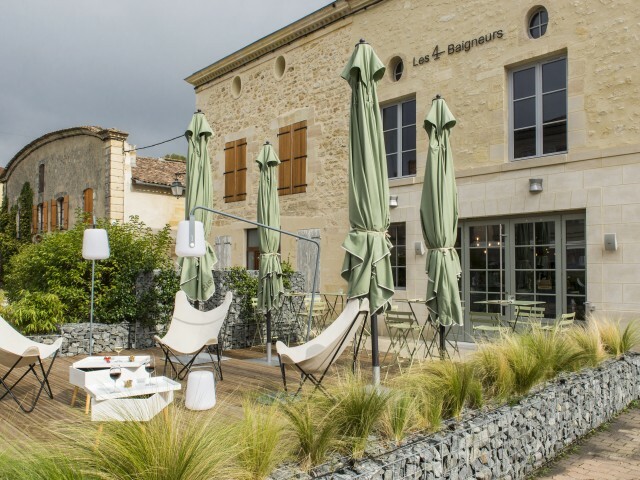 Rich in this terroir, it is with pleasure and pride that the 4 Baigneurs wine bar offers a wine list with very local wine productions. The terrace of the restaurant, allows to enjoy a glass of wine facing the small port as a boater on his boat.